Do you feel overwhelmed by all the responsibility of running your own business? Your just not sure what is the best direction for you to take in your business? Unclear of what ways to market your business? Relax your not alone. Every business, especially budding entrepreneurs go through a learning curve. Once you put your business foundation in place, get the basics set up, then it’s time to move into marketing your message. There are so many ways to get the attention of your desired customers, but what is the best way for you? You may be an introvert or an extrovert. Different types of people require different types of strategies. Sometimes you may feel stuck, lack energy or are just plain unmotivated. So what do you do? First of all pause and take a breath. Pat yourself on the back for making it this far. Ask yourself if you still feel inspired about what you are doing. Did you begin your entrepreneurial path because of necessity? I highly doubt it. It most likely began out of passion. Entrepreneurs know starting a new business is a gamble and a lot of hard work. If you don’t feel passionate about what you are doing you’ll burn out and your business won’t last. Sometimes just taking a walk, listening to some motivational podcasts or reading a book will put the “in” back into your inspiration. One thing that has really stood out to me this past year is that the really good successful marketers have been working on their businesses a long time. It may look like they succeeded overnight but when you ask them or dig through their content you’ll see they’ve been consistent and worked at it for 5-10 years or even more. So after you get your oomph back how do you figure out what is the best strategy and marketing method for you? Let’s explore some different business leaders and their methods so you can see if anyone of them resonate with you. First of all I’d like to clarify I’m providing different examples for you based on my observations so you can find the best mentor for you in your business. When you find a mentor in business. Follow them, read their blog posts, and learn everything that you can from them, just be sure to use your own voice. Don’t be them, be yourself. Are you an introvert, dislike networking and feel very vulnerable in the world. Don’t worry there are marketers just like you who are reaching new heights and achieving great success. One of those marketers is Leonie Dawson. She’s a self-proclaimed introvert who lives in Australia and is completely rocking it in her business by simply being herself. She creates business products for her goddess community. She’s very good at giving herself boundaries, sticking to her writing/work time and relying on her team. Leonie’s business has been built up over several years. She adds new products to her inventory every year for her membership community. She stays really connected with her audience through blogging, newsletters and social media. She resonates and has a strong bond with mothers and women. Leonie provides all her products including new releases through her paid goddess community. You see them. The one’s on stage shouting from the rooftops all about their message. They are empowering and really good at what they do. They love being in the limelight. Some may have been introverts but some how they managed to pull out the extrovert side of themselves and it’s working. Working really well. They exude confidence. An example of this would be Suzanne Evans. She says it like it is. She doesn’t hold anything back. She likes to have fun, and she’s not afraid to share her fun with you. She does a lot of public speaking and live webinars to reach her audience. She’s also an author. Suzanne offers many training products you can purchase through her website. These three ladies are soft spoken but very powerful business leaders and could fit in both categories. Fabienne Fredrickson specializes in client attraction. Helping you find your next client. Fabienne hosts live in person masterminds and live webinars though-out the year. She also connects with her followers through her Play Big Master Class podcasts, consistent blog posts, newsletters and is very, very active on social media. Fabienne works with high end clients but offers numerous resources on her website. Ali Brown is considered the voice for women’s entrepreneurial success. Ali started her business 11 years ago from her New York apartment. She now lives with her husband & twins in Arizona. She does live webinars, is very consistent with her blogging, newsletters and is another marketer who is very active online. Ali offers VIP high end consulting and also has lot’s of resources on her website. Maureen Simon is the founder of The Essential Feminine Company™ (TEF)-a lifestyle and business design company that supports women to create successful powerful lives that incorporates their feminine attributes and gifts. Her company provides learning environments and products that support women in claiming, living and leading with their natural strengths and talents. Maureen works with her clients one on one through consulting and through occasional courses. She teaches women how to succeed in their lives, especially how to soar their businesses to new heights. She’s great at helping you break your glass ceiling. Maureen keeps in contact with her audience through monthly newsletters, social media and occasional webinars. Her newest webinar, How to Earn What You’re Worth ~ Six Steps to Doubling Your Income Within a Year is now open for registration. This is a free event. Full disclosure: Maureen is a client of mine. What do all these fine ladies have in common? They have a team! They don’t try and do it all themselves. They incorporate fun into running their businesses and they are good at setting clear boundaries while working on ideas and projects that bring them success. I hope this breakdown helped you see the different ways these ladies have used marketing to reach their audience. Maybe one of these wonderful ladies who have inspired me greatly are the perfect fit for helping you grow your business or break your financial ceiling. Maybe it’s time to break past the $100,000 or million dollar mark. High end consultants are perfect for helping you break through. If you are done trying to do it all yourself and are ready to hire a social media manager/marketer contact Carol today! Social Media Help 4 U is a virtual based business that supports authors, businesses and corporations based on integrity. Social Media Help 4 U offers conscious based business services, providing intuitive and skill based social media management. Carol and her team manage social media accounts. They assist their clients in building their online presence, engagement and connections with like minded people, customers and clients. They are fully aware that their clients online reputation is at stake. With the values of integrity, honesty and dependability being their top priority. 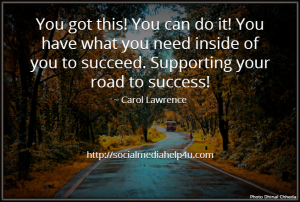 For positive support, business, social media & author tips join Carol on Facebook. Are you a business who has been looking for help with your social media but you are unclear where to begin? Contact Carol today for our beginning of the year special. Available to very committed businesses. Services and contact info here.